There is nothing more pleasurable than al-fresco dining, or celebrating an important event outdoors in the fresh air. The problem with planning an outdoor event in the UK is that the weather does not always play ball. So all your best plans and intentions can be ruined with just one downpour. To make sure your outdoor event goes without a hitch, even if it does rain, it is essential to put a few contingency plans in place, just in case. It might seem obvious to move the party or celebration indoors but when planning the event you should consider how much room you have inside, as compared to outside. Typically people may have a larger outdoor area and would therefore tend to invite more people, but if there is a chance that it might rain, keep your numbers down in case you have to go inside at the last minute. If you are having a barbeque and it starts to rain, having food that can be cooked in the oven or grilled will save you from having to go out and get a different kind of food for your guests. So anything like sausages, burgers, chops etc. that can be put under the grill and plenty of salads can be prepared in advance and consumed in or outdoors. Many people hire marques or large parasols for a summer event anyway as these items provide shelter from the sun on particularly hot days. If you have plenty of areas for your guests to take shelter under, and the rain is more of a drizzle than a downpour, you could wait under the umbrellas until the rain passes. And don’t forget about shade and shelter that is already there, such as garages or awnings. If you suspect rain on the day of your event, why not invest in a few additional items that will make the inside more like the outdoors? For instance, tropical trees, jungle decorations, Hawaiian tablecloths, beach accessories like buckets and spades will all add to an outdoors theme inside. If you were planning outdoor activities and the rain comes, making sure you also have some indoor games to play will stop your guests getting bored and fed-up with the rain. To keep the party going while you are bringing in all the food etc. organise games such as charades and pass round nibbles and plenty of booze! If you plan for rain and it does not arrive, you can simply get on with the event with no stress or worry. What we mean is to carefully look at each aspect of the day and imagine that it will rain. 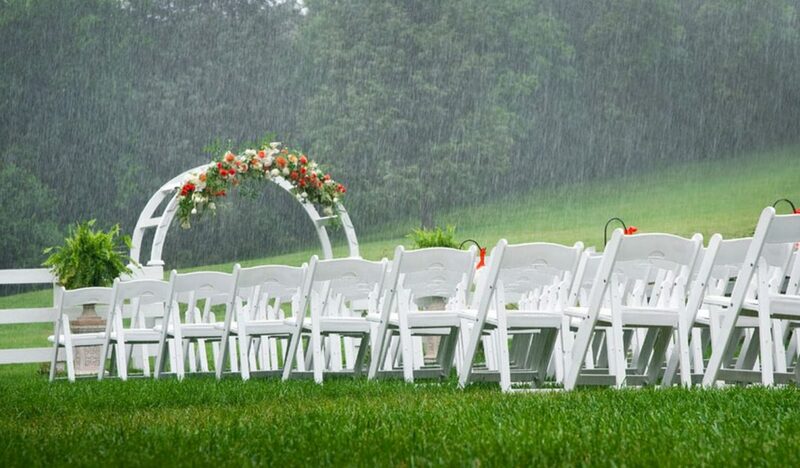 So, if the event is a wedding, having the vows under a porch or shaded area will protect the happy couple from getting wet. Booking a marque will make sure that all your guests are dry in the vent of rain. Ordering a marque with added sides not only keeps draughts out but allows for extra space to store muddy footwear and wet clothes. Putting these simple preparations in place will ensure a successful day, rain or shine!